Bulletin Board Ideas below are categorized by subject. Our Subject Bulletin Board pages provide you with resources to help display your students' learning while keeping your classroom walls looking great all year long. Within each subject you will find fun and educational resources that are specific to the various topics covered within that subject area. Several of the bulletin boards even include photos. 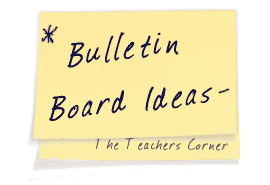 Use the link at the top of the page to send us your favorite Bulletin Board Ideas!